„Vlatausa“ Ltd. was established in 2001 in Kaunas / Lithuania. 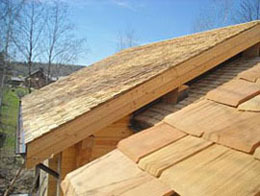 From the very beginning the main direction of our activity was and stays the production of split and sawn tiles of Siberian larch. There work 22 experienced people in our company who were trained in West European countries which have centuries-old experience in production of various wooden tiles. Thanks to high worker qualification and good production quality our products are sold to the biggest companies in Germany, Austria and Italy which use the wooden tiles for covering of roofs and walls. As the demand for tiles grows each year, the company also increases the volume of its work by expanding production and striving to meet the current needs of customers.